We are amongst the most reputed names in the industry, offering Pitching A Tent. Frame tent: we are the manufacturer and supplier of tarpaulins for a frame tents. 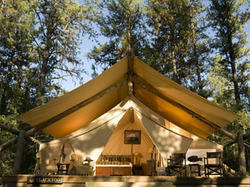 We offering wide range of tarpaulin covers for a-frame tent and we are ready to supply based on customer requirements. We provide tents in all sizes, shapes, colors and fabrics for different occasions ranging from weddings to emergencies. Every tent is available in attractive packaging which can be custom picked as per customer preferences. Go through the individual tent specifications and make the pick wisely! We are amongst the reckoned names in the industry, offering highly durable array of Frame Tent that are easy to install and have high strength. Our entire product range is delivered in standard sizes and is tear-resistant in nature. Frame Tent is offered with varied capacities and ensures easy installation. Banking on our enriched industry experience, we are able to supply A Shape Tent. Size: Inner tent 4.10 x3 mtr and Outer Tent 6 x 5 mtr.